Santa Fe #4654, one of eighty SD26 rebuilds, descends the Cajon Pass on December 31, 1975. The unit's "blower bulge" (just aft of the cab) and displaced roof-mounted "torpedo tube" air reservoirs, its signature features, are clearly visible. The SD26 was essentially an EMD SD24 diesel locomotive that was specially modified by the Atchison, Topeka and Santa Fe Railway in the mid-1970s. The rebuilt locomotives saw service throughout much of the Santa Fe system. 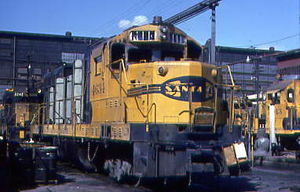 Over half the SD26s were retired by Santa Fe in 1985 and replaced with state-of-the-art equipment, while a year later the remaining units were sold to Guilford Transportation Industries (now Pan Am Railways). Former AT&SF #4673, the last operational unit, was scrapped in 2012. 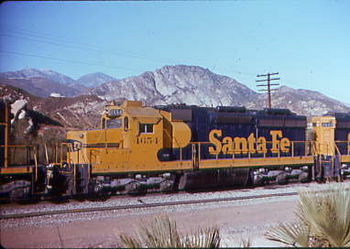 In an effort to spare the cost of purchasing new motive power, the Santa Fe elected to expand on the success of its CF7 and other capital conversion programs and extend the life of its fleet of 80 aging SD24s by rebuilding them at its San Bernardino, California workshops between January 1973 and January 1978. The first locomotive to go through the SD26 Program was Santa Fe #4533, a 2,400 horsepower (1,800 kilowatt) C-C unit built by General Motors' Electro-Motive Division of between 1958–1960, which entered the San Bernadino shops in January, 1973. Its four roof-mounted "torpedo tube" air reservoir tanks were removed to allow for the installation of a new inertial air filtering system (SD24s lacked a central air filtration system) which was located directly behind the locomotive cab. The resulting "blower bulge" or "hump" became the the most obvious visual identifier of the SD26. Two of the air tanks were reinstalled toward the back roof on either side of the radiator section fans, while the other pair was situated on either side of the dynamic brake fans. EMD 16-567D3 prime mover was removed and replaced with the newer EMD 16-645E3 engine, which boosted the horsepower rating to 2,625 and gave rise to the 26 designation. The SD24's unreliable electrical system was replaced with upgraded circuitry, consisting of new wiring harnesses and EMD's new "Dash 2" circuit cards. The unit was retrofitted with extended-range dynamic brakes as well. The foot boards were reconfigured, the locomotive bell was removed from the front pilot and mounted midway between the radiator fans and dynamic brake fans, and a roof-mounted beacon and cab air conditioning system was installed. The unit retained its one-piece windshield and nose-mounted locomotive classification lights. When all of the modifications were complete, the locomotive was given a fresh coat of "Yellowbonnet" paint and reassigned as #4633 (all SD26s were given a 100-place "bump" in numbering to reflect their new class). Santa Fe #4634 at the company's San Bernardino shops midway through its conversion from SD24 to SD26 in 1976. Over the next 5 years, all of the SD24s on Santa Fe's roster would undergo similar modifications (the last one being #4508) though not all received air conditioning, which was omitted from the following units: #4603, #4604, #4607, #4608, #4620, #4623, #4625, #4629–#4631, #4636–#4638, #4640, #4643, #4646, #4648, #4651, #4652, #4655, #4656, #4659, #4663, #4665, #4668, #4671, #4674, #4677, and #4678. In the early-1980s, all of the stock one-piece windshields were replaced with two-piece units similar to those used on the EMD GP20, a move intended to bring standardization of windshield glass to several classes of Santa Fe locomotives and thereby reduce maintenance stockpiles. A "second generation" EMD-style traction motor blower housing was fitted to the left side of later rebuilds. Ten of the locos (#4601, #4603–#4607, #4612, #4617, #4618, and #4675) were outfitted as "drone" or "slug" units for work in the Kansas City and Barstow hump yards. Ten others (#4611, #4627, #4629, #4640, #4645, #4648, #4667, #4674, #4677, and #4678) were configured with "Locotrol" remote control equipment for use in coal, grain, potash, and molten sulfur unit train service. The majority of SD26s were placed in both general and intermodal freight service in the Kansas City — La Junta — Albuquerque — El Paso freight pool, while others spent their years running up and down the railroad's "Coast Lines." The units became known "slushbuckets" among rail fans in reference to their distinctive turbocharger sound, which was considerably more subdued than that produced by either the GP40 or SD40, both of which utilized the same power plant. #4625 was wrecked near Rustler Springs, Texas in August of 1974 and was subsequently sent to the scrap yard. Changing philosophies regarding motive power expenditures led the Santa Fe to begin trimming its SD26 roster in the Spring of 1985, when 44 of the locomotives were retired and traded to EMD in exchange for 15 new GP50s. The other 35 units were sold off at the end of 1986 for use on the Guilford Rail System (GRS). Guilford #643 (former AT&SF #4673, the last surviving SD26) ended life as Springfield Terminal Railway (ST) #643, when it hit the scrap pile in 2012. This page was last modified 04:36, 25 August 2013.